Love mermaids? 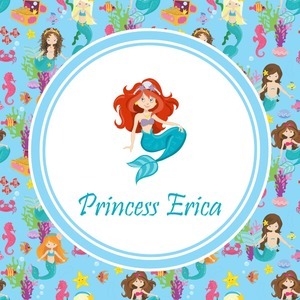 This customize-able design has mermaids, sea creatures such as seahorses, fish, crabs, seahorses, oysters, seaweed and of course a treasure chest. We chose a soft blue to represent water for the background. You can change this to any color you desire. We have featured a mermaid in a round label, along with personalization under the mermaid graphic.